His parents named him Murphy, but everyone calls him Barfi! Always ready with a prank up his sleeve, he's quite the charmer, especially with the ladies! In Darjeeling, Barfi (Ranbir Kapoor) is the talk of the town. Even though he can neither speak nor listen! His bitter-sweet relationship with two beautiful young ladies, Shruti (Ileana D'cruz) and Jhilmil (Priyanka Chopra) sets in motion a chain of events that will turn his life upside down! 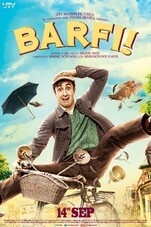 UTV Motion Pictures and director Anurag Basu invite you to witness the amusing, naughty and sometimes crazy antics of Barfi. A heart-warming tale of selfless love and about finding happiness in the smallest things in life; that tells you no matter how tough your life may be, "Don't Worry. Be Barfi!" Watch All Videos of Barfi! View Full Box Office Analysis & Reports for Barfi!